Poultry Probiotic Ingredients Market size was over USD 80 million in 2019 and may expect gains at over 7.5% up to 2025. Rising demand for meat & meat products consumption owing to livestock production and easy availability of these products may stimulate poultry probiotic ingredients market size. They aid in maintaining balance between gut flora and manage gastrointestinal tract for high performance and health. Moreover, increasing preference for natural growth promoters over antibiotic ones by livestock farmers owing to development of resistance to disease may stimulate the industry growth. Poultry probiotic ingredients offers nutrients and digestive enzymes to animals which act as an effective feed additive, which in turn increases the animal performance. It is widely used for layers, turkeys, broilers, breeders and chicks & poults. Increasing growth promoter’s usage in poultry feed due to demand for high yield healthy meat products should drive the industry growth. Global meat production is projected to increase by 48 million tons by 2024. Probiotics improve growth performance without leaving any residue in meat products which are considered safe for human consumption. Growing demand for meat consumption among consumers which has developed preference for higher quality and taste may drive the poultry probiotic ingredients industry growth. Probiotics maintains weight and decreases mortality rate in broiler and breeders which results in high profits for agribusiness. Increasing investments in research to develop new formulations along with technological innovations is likely to promote poultry probiotic ingredients market. Rising demand for cost effective solution which provide nutrition with better quality products may stimulate the industry growth. Favourable regulatory guidelines regarding the involvement of probiotics in animal feed may drive the industry growth. 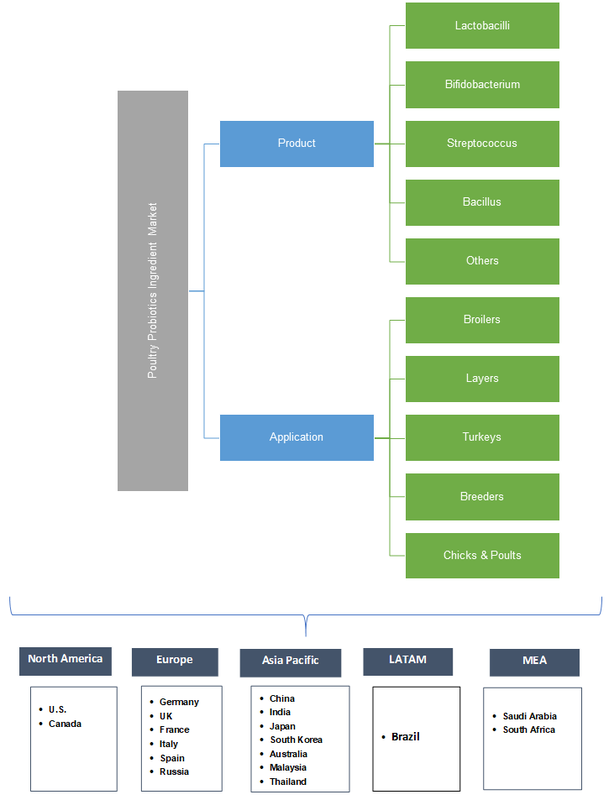 Several manufacturers are engaged in microencapsulation technology to develop better products which provide better stability, may favour the industry growth. 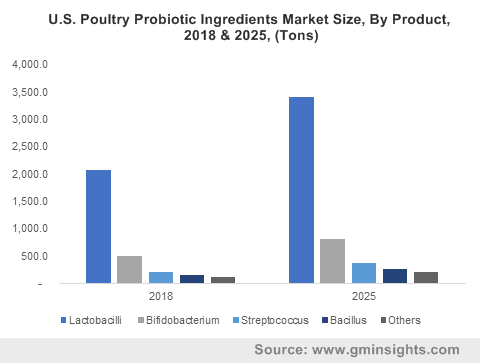 Lactobacillus based poultry probiotic ingredients market size was valued at about USD 45 in 2018 over the projected timeframe. Increasing egg consumption among consumers for high protein intake may stimulate the product growth. These are used in layers to enhance egg quality and provide favourable environment to eggs for proper growth. Streptococcus based product segment may register gains close to 8% over the forecast period. These are widely used for broiler chicken as growth promoter for weight gain and health. It aids in maintaining microbial flora in gastrointestinal environment of poultry animals which in turn boost the immunity system, thereby promoting the product growth. Bacillus based poultry probiotic ingredients market may witness significant gains over the forecast timeframe. It is an easy to maintain bacteria which is highly stable and is beneficial for feed efficiency and intestinal integrity. Furthermore, it can also be used as an alternative to feed antibiotic growth promoters in broiler production, thereby increasing the product demand. Poultry probiotic ingredients market demand from broiler application was valued at over USD 50 million in 2018. They are widely used as an alternative for antibiotics growth promoter and usage probiotics in order to gain weight in broiler chicken may drive the market growth. It also aids in tuning intestinal environment and digestive function in broilers, which should stimulate the industry growth. Poultry probiotic ingredients market size from turkey application may register significant gains at over 6.5% up to 2025. Lactobacillus are widely used for turkey which maintains gut health and enhance digestibility which is likely to boost the product demand. Probiotics act as effective growth promoters in turkey which maintains a healthy immune system and promote the industry growth. Poultry probiotic ingredients from breeder’s application may surpass USD 8.5 million by 2025. Rise in demand for cheap and high-quality chicken may stimulate product demand. Growing consumer awareness regarding quality of life and healthy food is likely to drive industry growth. Investments in technological developments and R&D activities may drive the industry growth. North America, driven by Canada and the U.S. poultry probiotic ingredients market size register significant growth over 8% up to 2025. Growing consumer consciousness towards consuming high protein products may drive the overall market. Favourable regulations by FDA regarding GRAS approval for these products along with antibiotics ban in U.S is likely to drive industry growth. Europe driven by UK, France and Germany poultry probiotics market demand may surpass USD 35 million by 2025. Rising concerns towards livestock disease outbreaks and AGP’s ban in the region may boost the product demand. Increasing demand for quality feed along with increasing R&D spending may favour the industry growth. Asia Pacific led by Japan, India and China poultry probiotic ingredients market size was valued at over USD 25 million in 2018 and may exceed in the foreseeable timeframe. Rising meat consumption in the region owing to its rich protein content may drive the industry growth. Supporting regulation regarding the antibiotics ban along with various occurrence showing fatal effects of antibiotics residual accretion in meat products may drive the regional growth. Global poultry probiotic ingredients market share is fragmented with major industry players Novus International, Biomin, DuPont, Evonik Industries and DSM. Companies are involved in joint ventures and mergers to increase their presence and focus on new product development to gain competitive advantage. Furthermore, most of the manufacturers are focusing to produce cost-effective products to foster the overall industry growth. These are the growth promoters which are used in maintain gut health of poultry animals. Probiotics help poultry animals to deal with environmental stress and regulate immune system and enzymatic actions which improves digestion and feed efficiency. These ingredients are used to avert bacterial infections, diseases and maintain proper microbial flora which may boost the product demand.